The trickiest part of sustaining a long-running adventure narrative is keeping the characters alive. Their lives have to be consistently believably perilous, otherwise it wouldn’t be much of an adventure. But they also have to believably survive those perilous conditions, otherwise the story ends. Often, this means making the protagonists infinitely skilled, and Outlander sometimes slips into that, especially when it comes to Jamie, who has gone from farm boy to endlessly resourceful hero rather quickly on the show. It also requires making your protagonists extremely lucky. Despite their frequent misfortunes that keep tearing them apart from one another and putting their lives at risk, Jamie and Claire also have their fair share of good luck and convenient coincidences that help them overcome the trouble. One of the most frustratingly lazy and simple ways to bestow protagonists with just-in-the-nick-of-time luck is to introduce a magical character who exists solely for the purpose of helping them overcome. Enter: Annekje, the Porpoise’s goat lady and Claire’s savior. But first, the problem. Claire’s problems don’t just end with the 50 miles that separate her from Jamie. She learns that Harry Tompkins, the man working for Percival and thought to have died in the printing press fire, is also on board the Porpoise, recognized Jamie aboard the Artemis, and reported him to the captain. Tompkins also tells Claire that there’s a warrant out for Jamie’s arrest, because someone tipped off Percival’s men about the corpse in the creme de menthe cask. So Jamie’s wanted for murder, and the captain intends to hand him over the second they land in Jamaica. Thank you, Tompkins, for being a very conveniently forthcoming and informative villain. So Claire’s in a pickle, and apparently the only way to get her out of it is to have a magical goat lady save the day. Annekje isn’t literally magical, of course. But she doesn’t exactly seem real either. Annekje is of unspecified nationality and speaks little English, but she speaks and understands just enough English to figure out exactly what kind of trouble Claire is in and convey a plan to her. At first, that plan involves helping Claire sneak away when the ship makes landfall on Grand Turk Island, using the goats for cover. That plan fails, as Claire runs into Captain Leonard before reaching the port. I was relieved, thinking Claire would have to find another way out of her problem that doesn’t hinge on the unconditional kindness and quickly concocted perfect plan of a complete stranger. But then Outlander doubles down on the trope by having Annekje come up with an even more far-fetched plan to help Claire. She gives her a raft and some of her own hard-earned money and tells Claire to jump into the ocean with it in the middle of the night in order to save her husband from hanging. First of all, Annekje suddenly magically knows more details about the trouble Jamie faces than Claire ever told her. Second of all, the development of the relationship between Claire and Annekje is hardly convincing enough to sell her sudden intense involvement in Claire’s life. I do realize that Outlander is based on existing novels and that Annekje is likely the result of lazy writing in the source material, but the show has made significant changes to characters before, and the least the writers could have done with Annekje here is better develop the relationship between Annekje and Claire so that it’s more believable that she would risk her life, make her a raft, and give her money for a woman she barely knows and who only showed her a little bit of kindness one time. Annekje is the most overt example of a character as mere device that this show has employed in a while. Much more attention is given to developing the relationship between Claire and Elias Pound, the 14-year-old boy who helps Claire tend to the sick on board the Porpoise and also becomes her surrogate son much like Claire’s relationship with Fergus when he was first introduced on the show. But whereas the character development with Fergus happened over the course of several episodes, Claire’s maternal bond with Elias unfolds hastily over the course of this single episode only to conclude with his death. 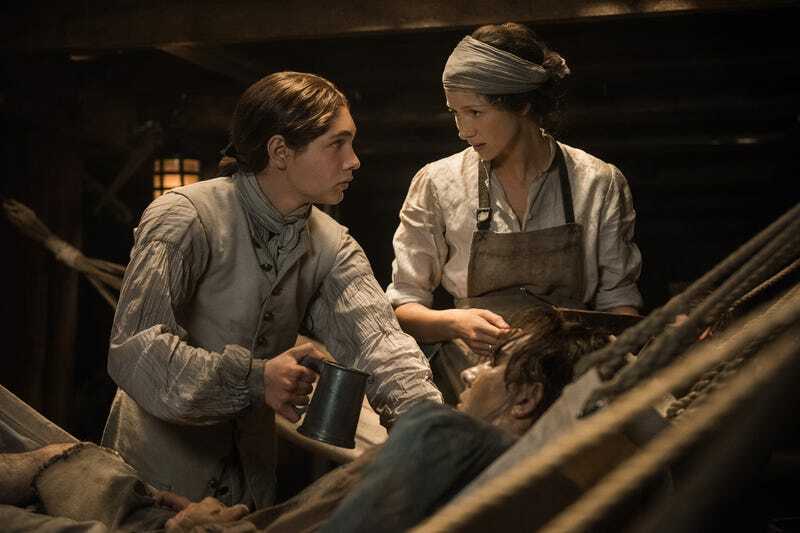 It’s a cheap way to give Claire a personal stake in the typhoid outbreak, but it doesn’t completely fail, mostly thanks to a killer performance from Caitriona Balfe. Elias literally confusing Claire for his dead mother as he dies in her arms is a bit heavy-handed to say the least. But the image of his bagged body plunging into the sea alone, contrasted to the earlier sequence of several nameless bodies plunging into the sea at once, is powerful. All in all, the character work that unfolds on the Artemis is much better than on the Porpoise. Finally, Jamie gets put in his place for his often short-sighted and selfish behavior. And he’s put there by Fergus. After flipping out on the captain for making a deal with the Porpoise crew to hand over Claire, Jamie gets thrown in a cell below deck. He hatches a crazy stupid plan to have Fergus pickpocket the keys, set him free, and lead a mutiny in order to make the ship sail faster so he can catch up to Claire. Fergus, thankfully, sees his plan for the garbage that it is. He cautions Jamie, pointing out that they won’t likely survive a mutiny, and then Jamie goes on an angry rant about how Fergus clearly doesn’t understand love if he isn’t willing to move heaven and earth for it, vowing to withhold his blessing of Fergus’ and Marsali’s marriage if the boy doesn’t help him execute his reckless plan. Of course, what Jamie fails to realize is that Fergus refuses to go through with the plan precisely because of love. He loves Marsali, and he loves Jamie, too. And he doesn’t want to put either of their lives in danger by helping stage a mutiny. It’s Fergus who comes off as the champion of love in the end, not Jamie. The storyline plays on existing character development for both characters and their relationship to one another, as well as Fergus’ relationship with Claire. For those reasons alone, it’s much more compelling than the events on board the Porpoise. It is definitely refreshing to see that Captain Leonard believes Claire so emphatically. Jamie just can’t catch a break from seasickness. I, too, am ready for the characters to be on land again because I’m getting sick of all this puking. Who betrayed Jamie by telling the authorities about the body in the creme de menthe? I love that Marsali calls Jamie out for being an idiot who can’t see how much Fergus cares about him.